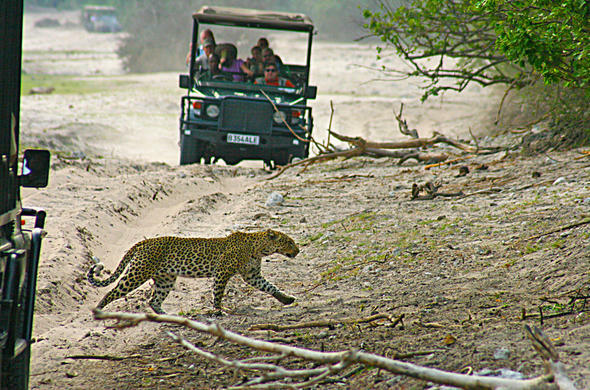 The Leopard is one of the most elusive animals that tourists try and spot on a Chobe National Park safari. It is one of Africa's Big Five and is often seen in the early morning and late afternoon. The Leopard has black spots (also known as rosettes) covering its golden coloured body. Leopards have rosettes covering the length of their body and their tail ends in a white tip. Their belly is a white / off-white colour. Their ears are rounded and have a white tip or border around them. Leopard cubs are much darker and have woolly hair and fewer spots. Leopards are adaptable and have a flexible habitat, being able to live in open grasslands and shrub lands, riverside woodland and in rocky hilly country comfortably. In the dry areas, Leopards can be spotted in areas which have 200mm or less of rain as well as in higher rainfall areas such as the Okavango and Chobe National Park. Leopards are more active during the cooler hours of the day and at night. 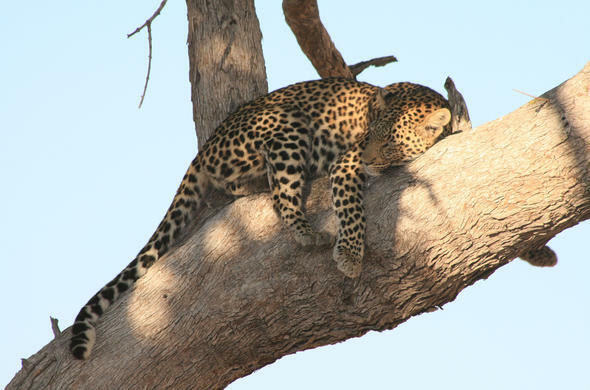 They can often be spotted lounging in trees under the shade in the scorching hot summer conditions. 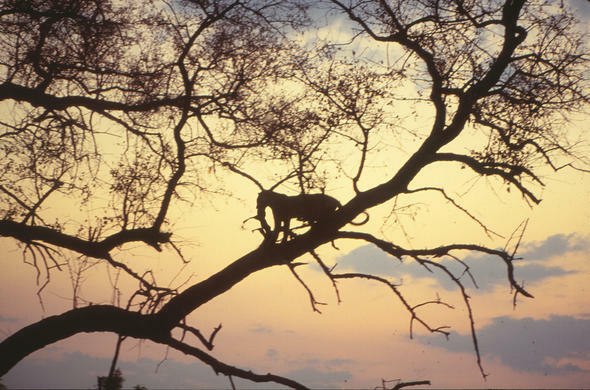 Leopards use trees for protection and to keep away from danger such as Lions and Hyena. They also are very powerful and pull their kills up into the forked branches of trees to store it away from predators. Male Leopards mark their territory with urine, droppings and tree scratching points. They guard their territory jealously from other males, and will only share their territory with a female. A Leopards marked territory ranges from 10 kilometres square to several hundred kilometres - the size being dependant on the amount of food available in the area. 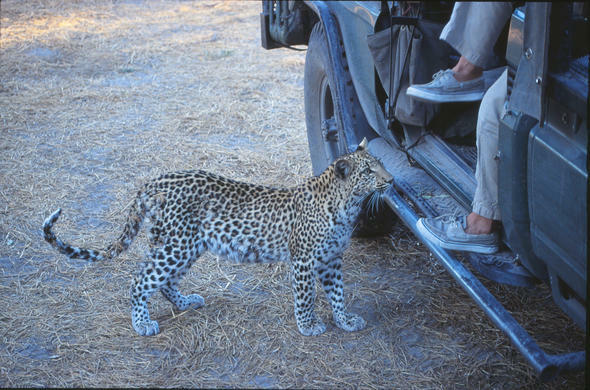 Leopards can be shy and withdrawn unless injured or trapped. They are very quiet cats, with their call sounding more like a saw cutting wood. They are solitary animals which usually only pair up during the mating season or accompany females with their cubs. 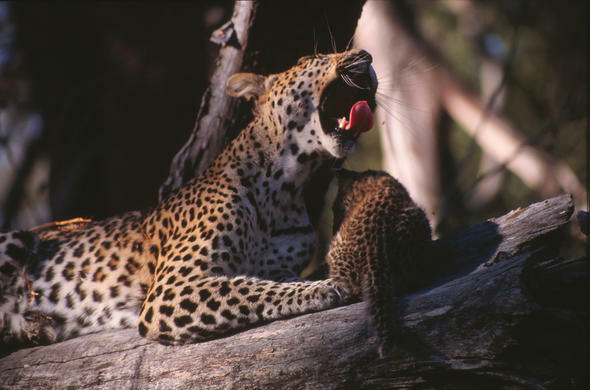 Leopards eat a wide variety of foods ranging from insects, rodents and small birds to medium to large antelope. In the rocky hills, Leopards will often feed on Dassies (also known as Rock hyraxes). They stalk and pounce on their prey, and once the prey is dead they will then drag it under dense bushes, into the fork of a tree or amongst rocks to discourage scavengers. 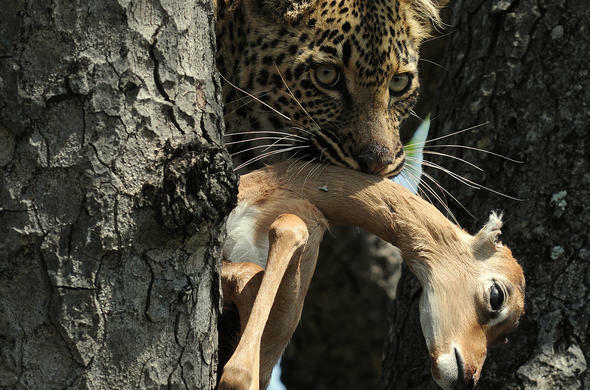 A Leopard might not always eat everything they have caught, but instead leave some for later, even if it is decomposed. Leopards breed all year round, with a gestation period of up to 100 days. They give birth to litters of 2 to 3 at a time, each cub weighing in at around 500g. Females will normally give birth in dense cover such as bushes or rock crevices.